Need more information about booking Home 9628317 ? Set just outside of Waterval Boven (one of the most popular weekend destinations among climbers and mountain bikers form Joburg and Pretoria), Tegwaan is a destination in itself: it is the closest place to the Restaurant(-At-The-End-Of-The-Universe) crags, and closely connected to some of the biking and hiking trails. We also have our own ponds and fish, so bring your rope, your hiking shoes, your bike, your fishing rod or your hammock! Your dogs will also love it – and they will be exhausted by the end of the weekend! Tegwaan is also an ideal stopover for travellers: being just a few kms off the N4 on a good road, just halfway between Jo’burg and Kruger National Park, it’s an easily accessible place to break up the drive and enjoy a properly relaxing day by the pool, followed by a braai under the stars and an evening by the fire. Tegwaan has one house and two cottages over 34ha of land, so you’ll always have privacy and quietness. It’s mostly self-catering for now, but inquire about our locally-made breakfasts if you’re interested! 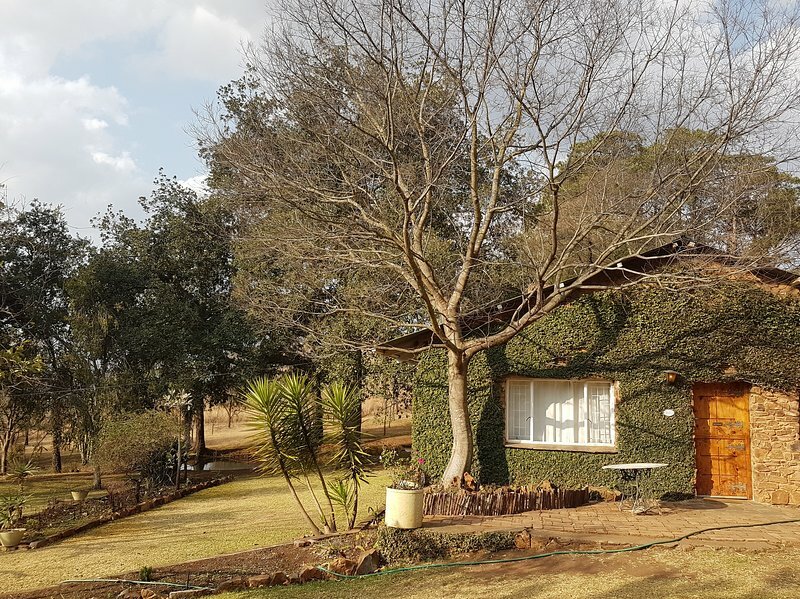 The Stone Cottage can accommodate 6-8 people and so is ideal for big families or groups of friends (there’s one master bedroom, two twin bedrooms and, should you need it, one sleeper futon in the living room). No room is en-suite but the shared bathroom has shower and tub and there is an additional toilet. Whether you’re into game nights, hanging out, reading books or watching flames, the big fireplace will keep you warm and cosy in the evening. From the living room you’ll have direct views over the lush garden and one of the ponds – a perfect place to watch the early morning sunlight peer through the macadamia orchard with a warm cup of coffee in your hands! The fully-equipped kitchen also opens to the back of the cottage where you’ll find a shaded patio (the best place to have lunch) and the braai area (the best place to have a beer). There’s no dishwasher but housekeeping is included each morning. Don’t worry about coals, we’ve got wood aplenty! The cottage is all yours, but obviously you’re welcome to enjoy the rest of the property as well. Have a walk around and you’ll be amazed at how diverse this little paradise is! Or take a chair and just chill in the garden and see how many different bird species you can spot (we haven’t tried yet but we think there are at least 20 that we spot on a regular basis! The natural panoramic outdoor swimming pool will feel amazing after a day out! Fishing is free for guests. We’re no experts but apparently the bass in our ponds are big, and we made a deal with our partner across the road (Troutways) so that you can also test your fly-fishing skills for free. In both cases it’s catch-and-release. Dogs are welcome but please note that we do like to let our chickens roam free when there are no dogs around, so please make sure to let us know if you have dogs so that we can keep the chickens safe and you can maybe take your dog off the leach. We charge R60 per dog per night and our standard policy is that dogs should be kept in control at at all times. Off leach at your own risk. Vodacom network is generally okay, but you’ll have to walk around the property a bit to find MTN. No hi-speed Wi-Fi for now but we can give you access to our 3G wireless if you need it. Laundry washing available upon request. Let us know if you need a portable crib, a high chair or toys for your kids. We have a one-year old and a 4 year-old, so we may be able to sort you out. Don't hesitate to inquire about unusual check-in or check-out times. If we don't have back-to-back bookings we're happy to be flexible. Additional mattresses available on request. Our friends at Roc n’ Rope manage the bookings for us so you will meet them to get the keys and they are incredibly knowledgeable on activities in the area, and always willing to help. They run a climbing shop/rental/school in town and they organise all sorts of outings and activities (we strongly recommend the Elandsriver waterfall abseiling daytrip! ), so don’t hesitate to ask them – they’ll always understand your specific needs (even if you don’t) and make your stay in Boven something that you won’t forget! You can get in touch with Tegwaan (the owner) through the contact form on this page. Send Tegwaan (the owner) an email through the contact form on this page. Alternatively, if there’s a phone number on this page, you can call them. How do I contact Tegwaan (the owner)? If you’ve already booked, go to Manage your holiday booking to view Tegwaan the owner's contact details or send them a message. Or send Tegwaan (the owner) an enquiry through the Contact the owner/manager form if you’d like a quote or more info first. When you pay online through the Book your stay form, a booking request is sent to Tegwaan (the owner). You’ll find out within 24 hours whether they’ve accepted - no money will leave your account before then. You can also request a quote from Tegwaan (the owner) through the contact form. The owner will email you the total cost for your dates and a link to book and pay online. Use the Book your stay form to pay provisionally online. You can pay by credit/debit card or PayPal. Tegwaan (the owner) will have 24 hours to accept the booking and no money will leave your account before then. Why can't I call Tegwaan (the owner) before booking? You’ll need to contact Tegwaan (the owner) to do this. Send them a message in Manage your holiday booking or through the contact form on this page. You can request to change the dates or number of people on your booking via the Manage your holiday booking page. To change your holiday dates use the Edit booking button. If you need to change the number of guests staying then send Tegwaan (the owner) a message. If Tegwaan (the owner) agrees, they’ll send you a revised quote outlining the changes. You can review and accept/decline this from the Manage your holiday booking page. You’ll have 48 hours to take action before the revised quote expires.